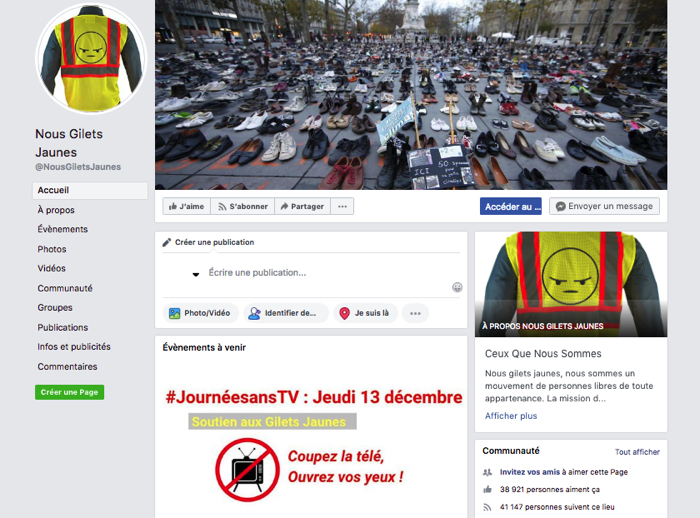 Facebook et son algorithme ont-ils permis aux Gilets Jaunes de naître et de se développer ? Utilisé par les militants de ce mouvement sans vrais chefs comme un média alternatif et un espace de démocratie directe, le réseau social semble en effet constituer un outil d’empowerment pour les « oubliés »de tous bords. Would Yellow Vests be just a huge Facebook group? At the origin of this winter movement that some compare to the Sans Culottes of the Revolution of 1789, sometimes to the Poujadists of the 1950s, there is the Web. Specifically, an online petition launched last spring by an unknown, Priscilla Ludosky, then several videos posted on Facebook this fall, again by strangers - hypnotherapist Jacline Mouraud and truck drivers Éric Drouet and Bruno Lefevre. All were calling for a drop in fuel prices at the pump, and called for a "national blockage". If the Yellow Vests were not born on the social network of Mark Zuckerberg, they have in any case clearly developed and organized, their "animators" being very present and active. Far from unions, which traditionally coordinate demonstrations and social movements, activists in yellow have made an appointment, across the country, every Saturday since November 17, 2018, through pages and Facebook groups - such as "Yellow Vests", or "Yellow Vests", with 39,000 and 54,000 members respectively. Not to mention dozens of pages and local groups, which often include many thousands of people, allowing them to exchange dates and places of meeting, to share news articles, or more generally to discuss among themselves . These live videos appear almost like parallel media. Because the Yellow Vests, who do not believe for the most part the traditional media, follow these lives with assiduity (several tens to hundreds of thousands of views with each diffusion), and discuss frontally with the administrators, not hesitating to ask them questions, and criticize them if need be - a fine example of direct democracy and "horizontal" organization, in short. In parallel, surveys regularly allow online activists to agree on common demands. In fact, Facebook and Yellow Vests were made to get along. It was almost written. For if we believe Tristan Mendès France, a professor of digital culture at the University Paris-Diderot, "Facebook is the ideal space of flowering for this type of destructured movement, atomized and without real representative: like them, the network social has no center, it is based on communities ". This movement, which includes young people but also "a lot of old people", could it have been born elsewhere than on this social network, which brews 34 million French users of all ages, not necessarily very young, and of all social categories ? "If Facebook was not there, this undeniable social distress would never have reached the proportion it has achieved in terms of visibility," notes in any case Olivier Ertzscheid, teacher-researcher in the field of information science. University of Nantes. Yellow Vests owe a debt of gratitude to Mark Zuckerberg, who changed the algorithm of his social network in early 2018, to highlight personal content and groups, to the detriment of traditional media pages. So, this is largely thanks to this algorithm, whose purpose is, according to the founder of Facebook, to allow people to "help each other" from a "common ground" and "to help establish a direct and responsible dialogue between people and their elected representatives ", that their groups were able to gather so many Internet users and gain notoriety. Until it materializes in real-world events, "IRL", resulting in meetings with the government ... and measures in favor of purchasing power. This way of organizing oneself online and then moving the lines inevitably brings to mind the Arab Spring, which would have developed on Twitter and Facebook, among other things, these two social networks which in 2010-2011 enabled Tunisians and Egyptians to mobilize and share information. At the beginning of the 21st century, will all revolutions now be born on the Internet? The algorithm of Facebook, which allows the messages of Eric Drouet and Fly Rider to go up in news threads of Internet users, and their videos become viral, Olivier Ertzscheid nicknamed "the algorithm of the poor people", which allows, "with the collapse of the intermediate bodies (unions and political parties)" and "the multiplication and the pregnance of connected screens and practices that substitute for physical sociability", to draw "in hollow a change of sociability". Finished, the good old unions: place to Facebook groups. "And at the level of the number of users of the platform, it would be crazy not to see the soil of a change of society or at least the way and means to society," concludes searcher.